Teachers Around The Country React To Investigation Into Ballou High School : NPR Ed We've heard from teachers nationwide about our investigation into Ballou High School. They say they see the same where they are: chronic absenteeism and pressure on teachers to pass students. So far the reaction has been swift and strong to our investigation into Ballou High School in Washington D.C., where we shed light on chronic absenteeism and a pressure teachers say they felt to pass failing students and get them to graduation. The day after our report, city and district leaders announced that two investigations would look into just what happened at the school, and at other schools around the district last year. We expect the results of those investigations late next month. A week after our report, the school's principal was reassigned. District leaders say her return as principal pends on the results of those investigations. On Friday the city council's education committee heard more than 10 hours of public testimony from district leaders, students, parents, teachers, residents, education advocates and many more. We've also gotten word from teachers around the nation who read, listened to or found the story on Facebook. 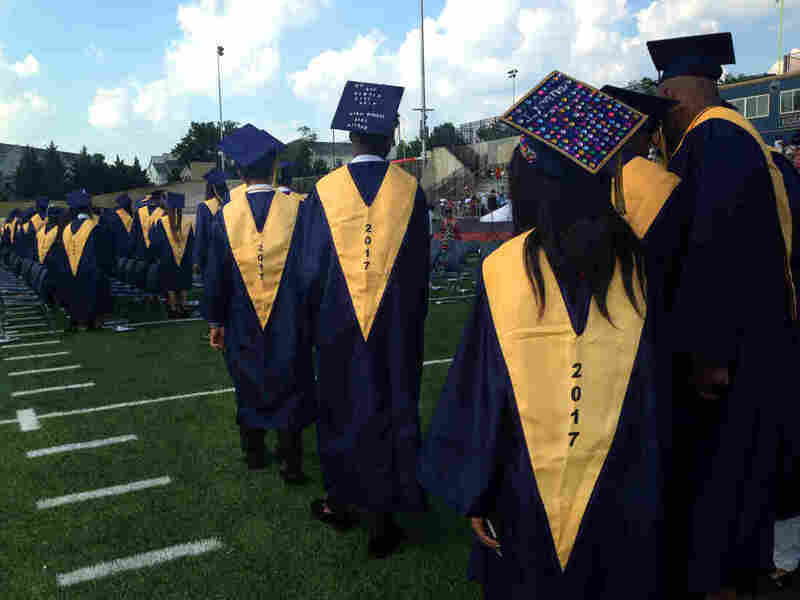 They told us of similar stories where they are: chronic absenteeism, a reliance on methods like credit recovery and makeup work to graduate students, as well as pressure teachers say they feel to pass unprepared kids. Understandably, many of those educators asked to remain anonymous if we shared their stories. We granted that when appropriate. "This happens everywhere. I hate the days grades are due. So much nonsense, accepting garbage work, 'adjusting' grades, pressure to 'work with students', etc." Jen Stephens, Facebook. "The same thing is happening in Chicago Public Schools! Our attendance rate is 96%, but most of it is altered. We are also not allowed to fail anyone ... but IF you dare fail anyone there better be mounds of paper work and they better not be a senior. Five teachers left last year and for 4 of them it was all because they couldn't ethically continue to work here." A teacher in Illinois. "Just retired after 35 years of teaching the sciences in Public Schools. This is not news. It has been going on for years. We, as teachers, have been sounding the alarm ... but no one listened. Students are not taught how to think for themselves but to pass standardized tests compiled by textbook/testing companies who are in bed with state legislatures." On Facebook, Kathleen O'Nale. "I know you have received a lot of responses like this but I just HAD to add mine because while I was reading your most recent story. I was FLOORED because I thought for sure you must be talking about the school I work at! ... Almost every single detail from the make-up work packets to the students who only show up for half a day every 15 days to avoid truancy matched with my experiences exactly." A teacher in Richmond Public Schools, Va.
"This has been an issue for a long time- the reality of what is going on in DC schools-I have witnessed it first hand in schools being an education advocate for 15 years. Handing kids a diploma doesn't make them ready for college or a job after high school in the real world. Many of my kids who got their diploma said all they had to do was sit in their seat to earn decent grades and a diploma but couldn't read or fill out a job application. We are failing our kids." Fatema Dariani Keenan, Facebook. "Reading this article and the quotes from teachers, I felt like there were lines that have been taken out of the conversations I have with my coworkers ... At the conclusion of my first year in this district, 2008-2009, I said beside two senior teachers ... who asked about a few students walking across the stage, "How in the world is he graduating? He didn't pass my class." We want them to pass, but not at the expense of an actual education. I much rather have kids hate me now than to resent me later." A high school teacher in Baltimore City Schools. "I am a special education teacher and I see this phenomenon happening way too often in charter schools in South Central Los Angeles, always aiming for 100% college acceptance. High expectations are good, but not if you don't back it up with social services, therapy for families, and rigorous work for students. Sometimes I hear kids say, 'Oh just test low and they put you in one of those (special ed) classes with easy work.' That's not what special education is for, but many struggling low income families have kids identified as special needs when it's a combination of poverty, lack of parental support, English as a second language, and other reasons." On Facebook, Crystal Kopp. "I am contacting you in hopes that you will continue to investigate the blatant fraud perpetrated by these schools and, if other teachers are to be believed, by virtually every school ... We're the adults, we know better, we're doing this to our children, our future, and it's wrong. This isn't what I got into education for, and trying to swim against the tide is exhausting and disheartening. Eventually I will probably follow many other teachers and leave the profession that I love knowing that it's the coward's way out and having to live the rest of my life with the shame of having given up the good fight." A teacher in South Carolina. "I am writing simply to say that you described my former teaching experience almost exactly. There are some areas that were not quite so bad, but the majority of what you described matches my own experiences very closely. You have expressed every argument I have been making for the past several years, and aside from having other teachers agree with me, I see very little progress or hope for it. After seeing no brightness on the future of my profession, I resigned over the summer to work as a substitute until I can find another position that is not so morally compromising." Teacher in Sarasota, Fla.
"I wanted to reach out to you to just let you know that many of my colleagues have been discussing the practices exposed in your article, and to us, sadly they are all too familiar ... I fully believe that these types of practices are normal in the current state of education. If not normal, at least widespread. When legislators try to rank schools on graduation rates, there is an incentive to manipulate the numbers. Schools are no longer holding kids accountable, and credit recovery is a total joke ... We have also endured pressure to pass kids that didn't earn it, and have excessive absences, give 50% instead of zeros, and take make up work up until the last minute. It makes me very afraid if the future." Teacher in Cheyenne, Wyo. "I left DCPS last year — after receiving several Highly Effective ratings and being a finalist for a Standing Ovation award ... This culture of passing is endemic, not just in DCPS but across the nation ... As a former 12th grade math teacher, I am acutely aware of the dilemma we all face. Last year I had a student who came into my Probability & Statistics class well below grade level, and became pregnant in the fall; she missed tons of class in the spring and by June had demonstrated no real mastery over any of the course standards. She was due in July and mine was the only class she was failing; my colleagues who knew her well told me that she wouldn't go to summer school or re-enroll after her child was born. Her diploma was in my hands. What should I have done? I lost nights of sleep over this young woman. I still don't know if I made the right decision." Former D.C. public school teacher, Robert Barnett. Editor's note, Dec. 18: An earlier version of this story included the name of the teacher in Cheyenne, Wyo. We have since removed that teacher's name for privacy.